A number of local observing stations experienced their record low temperatures for the date yesterday and the minimum temperatures this morning were chilling (see below, click to enlarge). Teens were widespread over the region away from the water, and there were single digits north of Bellingham, in the north Cascades and over eastern WA. This is one cold wave that is not going away, with the entire week being far cooler than normal. Ice and snow on non-arterial roadways are not going anywhere fast. But now the serious stuff. There is a real chance for a major snow event late Friday into Saturday--one with the potential to drop as much snow, or even more, than the event on Monday morning. At this point there is substantial discrepancy among the model systems, and thus great uncertainty for the specific amounts and their distribution. 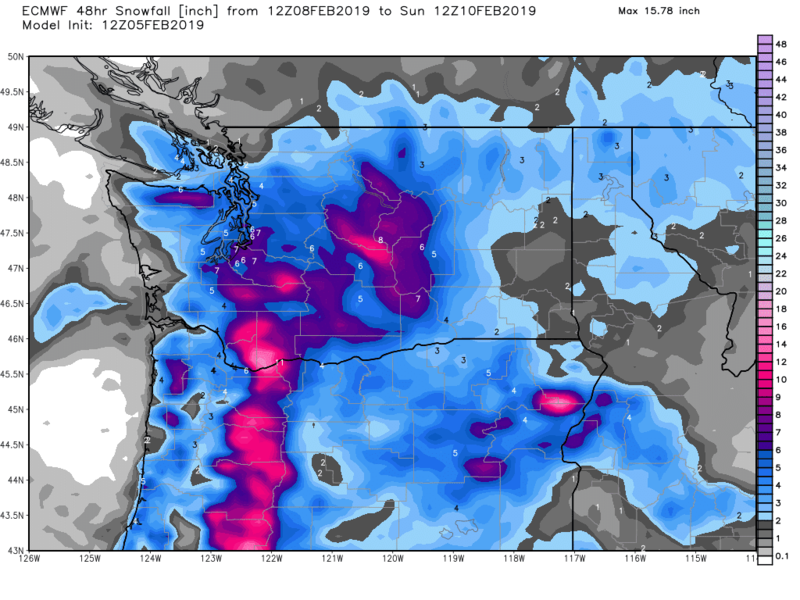 Let me start by showing you the accumulated snow totals for the Friday night/Saturday event from the European Center Model....one of the best in the world (but lower resolution than the UW model I show you frequently). The EC model starts the snow on Friday afternoon and the 48-h totals ending 4 AM Sunday are substantial: roughly 6 inches over Seattle and more on the western slopes of the Cascades of southern WA and Oregon. Lots of snow in eastern WA. The European Center ensemble of 51 separate forecast gives some idea of the uncertainty in the forecast. Here is their snow forecast for Seattle as a function of time (graphic courtesy of WeatherBell--an excellent service to sign up for, by the way). Most the forecasts are going for 2-6 inches of snow, with the ensemble mean about 4 inches. Their high resolution forecast (shown above) has more snow. But a few of the solutions have little snow (about 20% of them), while others are going for 6-12 inches. The U.S. model (the GFS) is quite different, mainly because it moves the low center associated with the snow farther offshore. We will examine the situation further in future days, but at this point, be warned of a potential snowstorm early in the weekend. If this plays out like the last storm (under playing the snow amounts) we are looking at 10-20 inches, just FYI. What is this looking like for North (Bellingham) area?! Randi asked about the Bellingham area. The European Center model graphic shows very little accumulated snow up here. Again, which is kind of a bummer. But if we'd had snow along with the insane winds on Sunday, we would have been looking at a paralyzing event on par with the blizzard of December, 1996 ~ at least in north Whatcom county. As it is, the tremendously high sustained wind and gusts this past Sunday night landed a huge cedar tree on/in my house. Crazy stuff. I’ve been closely tracking the Weather Channel and National Weather Service forecasts recently and noted a fair amount of discrepancies between them. Does anyone here know of any tracking records comparing accuracy of these forecasts? I was thinking of doing some myself but realized it’s more complex than I am capable of, relating to comparison of the long term focasts vs short term forecasts. I did a net search and didn’t come up with anything relevant. 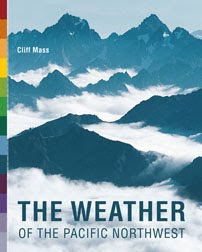 Cliff, do you think this is a similar pattern setting up like that of insane snowfall event that happened a few years back at Mission Ridge? (The Jan 2nd Storm?) My untrained eye sees similarities with what you wrote about last time on your blog. All snowfall events in Seattle require a delicate combination of cold, dry arctic air and moist, modified air from the Pacific. Just because the weekend event overperformed does not mean anything about the next storm. This event is likely to underperform the current operational runs. 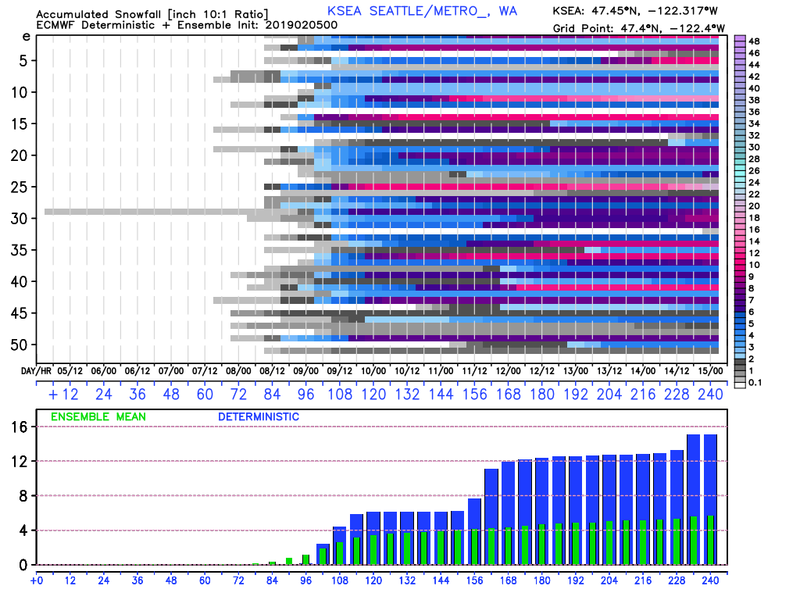 The ECMWF ensembles have been averaging ~4" for the Seattle area and the GEFS has been consistently 2-4". The operational runs are outliers. Additionally, there is a significant risk of 1) drying from easterly winds, 2) changeover to rain/mixed precip in the south Sound. There is certainly a risk of 6-8" totals in the Seattle area but this is far from a slam dunk, especially 3 1/2 days in advance. Hempy, based on what ive seen NWS is much more accurate and detailed than what the weather channel provides. To Gus Bus... if you read the Area Forecast Discussion (published 3 or 4 times a day), many of your questions will be answered. You will learn what the forecasters are thinking, what they're guessing at, what they're hedging at, models they're trusting (or not), degree of model convergence (or not) and the general tweaks and assumptions they are cranking into the forecast. The discussion is open and honest, but it might take a bit to figure out some of terms used and the forecasting vernacular. I think it's great to be able to look inside the heads of the forecasters. I read this whole thing several times a day, and Cliff's blog whenever its updated. The picture I get from those is more valuable to me than the processed weather data that feeds the various weather services and outlets, many of whom try to put their own tweak on it. No one ever says what will happen in Friday Harbor--Are we off everyone's radar or what? Given that the European Model is ALWAYS right, we're doomed. It looks also like there's no sign of warming after that until... who knows when?! What percentile would you say the actual snow was, on the predictions? From the 12 UTC Sunday ensemble I would figure we knew 3+ inches was >10% probable, and I would guess the actual event comes to no more than a 90th%ile outcome. How would you recommend people prepare for a 10% event, or a 2% or a 20%? You have to spend a lot of time looking like the fool who pre-deiced the roads for nothing. I would love to hear from SDOT but my impression is they don't deal with 10%s, they might consider 25%. Latest weather reports say the probability of significant snow has increased. Are the US models starting to converge with the European? Curious what will happen in Sequim as this next system comes in. Being rainshadowed, the precipitation generally needs to come from the North for a major event. What are they saying as far as where the moisture is coming from? One person's joy is another one's misery. I have a lot of trouble with getting to and from work with heavy snow fall. I have to take public transit. I am dreading this Friday. Any guesses when we will get a weather alert so that Delta will allow me to change my flight into Seattle on Friday? I'm tempted to pay to switch it to Thursday to get back before the snow. Perhaps as early as tonight. I'm looking at windy.com today (11am thursday) and the EU, NAM, and GFS models are all showing significant snowfall for late friday into saturday morning, even for my area (Auburn), more than 10 inches of snowfall. I've been burned WAY too many times to believe a snow event this far out, but will be interesting to see what the actual snow fall amounts, if any at all, do end up being. Thanks for the heads up about what to expect on Friday, Cliff. I'll be watching for your next blog post for any updates. Your blogs were very helpful for scheduling my activities during the last snow event. Again weather.gov is your friend. Although you don’t have a lot of focus from the human forecasters, searching your zip code will give you the digital model forecast for Friday Harbor specifically. Sunny, with a high near 36. Wind chill values between 24 and 33. North northeast wind 7 to 9 mph. Mostly clear, with a low around 26. Wind chill values between 18 and 23. East southeast wind 5 to 7 mph. Increasing clouds, with a high near 39. Wind chill values between 21 and 31. East southeast wind around 6 mph becoming north in the afternoon. A 30 percent chance of snow after 10pm. Cloudy, with a low around 30. North northeast wind around 7 mph. New snow accumulation of less than one inch possible. A 50 percent chance of snow. Cloudy, with a high near 39. East southeast wind 9 to 17 mph, with gusts as high as 23 mph. New snow accumulation of 1 to 2 inches possible. A chance of rain and snow. Cloudy, with a low around 26. Chance of precipitation is 50%. New snow accumulation of less than a half inch possible. A 40 percent chance of snow, mainly before 4pm. Cloudy, with a high near 33. New snow accumulation of around an inch possible. A slight chance of snow before 10pm. Cloudy, with a low around 23. A slight chance of snow showers after 4am. Mostly cloudy, with a low around 24. How did Seatac and light rail fare in the last snow storm? Flying back from London on Sunday, arriving around noon. Right now I'm most concerned about road travel from seatac to Seattle. You asked about the possibility of heavy snow for Mission Ridge with the type of pattern expected for this weekend. This is one of the ideal patterns for heavy snow in the Wenatchee/Mission Ridge area as lower level winds are forecast to come from the northeast which drives the moist air upslope on Mission Ridge. Since this will probably be fluffy, light snow, they could end up with a couple of feet or more. Hmmm. 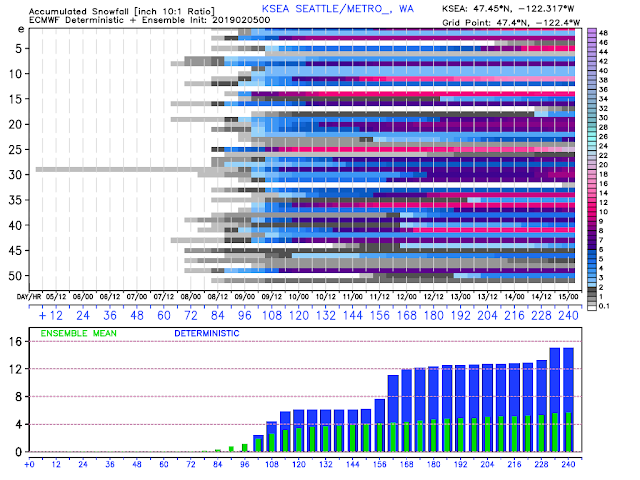 Not sure which models are in agreement, but the NWS model is much less dramatic with 2-3" in Seattle for Fri 4am to Sun 4am with Fri-Sat lows right around freezing. Beyond that it's a "slight chance of snow" Sun and Sun night with temps at or slightly above freezing. That said, around here it just takes slight changes in the patterns to make a big difference in how much and where the snow falls. I'll be hoping for the 8"
I have a flight Friday night at 9:30PM. 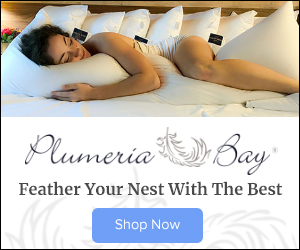 Is it worth it to look for a different flight? Will the southerly winds be strong enough to keep the snow away at Seatac? Hey y’all. I’m sorry to ask a novice question, but I’m struggling to decipher the information Cliff has provided. I live in Portland, Oregon, and i was wondering if one of you (or Cliff) might be able to give me a quick summary of snow expected over the weekend and early next week? I am curious, what is the overall cause of all of this? I am guessing that there is both a shift in the tracking of these storms to a track that is closer to the coast and that there is a shift in the location of the high pressure area in North Central BC. I figure that the storms are tracking closer to shore, causing the higher pressure differences between NW US and Northern Interior BC, which generates the Fraser outflows. I also figure that these outflows are enhanced by the positioning of the high pressure over North Central BC. Could this be the long term reason behind this string of storms and cold Fraser air? I wonder if there is any site that shows the trends in the storm tracks and the location of the high pressure over BC? It's NOON on Thursday, 2/7/19. Do you still feel this way, Cliff?